Ice dams are very damaging to your home and are a common problem after a heavy snowfall. Why are they so common? Because most homes are constructed with poor roof eave ventilation. Either roof ventilation was an afterthought such as in older homes, or roof ventilation provided in newer construction is inadequate or improperly installed. Any home that has icicles forming on its roof edge is a home with inadequate roof ventilation. When icicles form on a roof edge you will find an ice dam right there with it. And ice on a roof edge is very damaging. Snow can weigh from 3 pounds per square foot (SF) for powdery snow to 21 pounds per SF for wet / heavy snow (per FEMA P-957). Ice weighs about 4.75 pounds per SF so a foot of ice weighs 57 pounds per SF. You take that ice weight and hang it off an aluminum gutter and you have roof damage. Another consideration that makes ice dams occur so quickly is temperature fluctuations occurring above and below the freezing point during the snowfall. As the snow melts it then refreezes which creates ice and resulting ice dams which then results in higher concentrated loads and at roof eaves / gutters. As ice thaws water tries to flow through the gutter and downspout system. Since the downspout or gutter may be frozen, the water from melting snow cannot be removed from the roof so it accumulates increasingly at the roof edge, making a larger and larger ice dam. If they become too severe and beyond basic ice dam prevention techniques, you may need to have the ice dam professionally removed such as with a steam machine. What Does Ventilation Have To Do With It? As you can see in the diagram above, properly ventilated roofs allow ventilation to flow from the eave underside, through the unoccupied roof attic space and exit near the top of the roof. This allows a temperature similar to ambient to exist on both sides of the roof. A properly insulated attic floor does not permit heat from within the home to heat the attic space which assists in keeping the attic cold. Without proper roof ventilation snow on the roof is melted because the roof surface is warmed by a poorly insulated attic space. Water from melting snow will run between the snow and the warm surface of the roof. This water will then freeze and turn to ice once it gets past the exterior wall and hits an unheated roof edge or gutter. As the cycle continues the ice dam will continue to grow as the snow pack continues to melt. Water continues to flow down the roof surface and when the flowing water hits the ice the ice dam gets larger and larger. What Problems Do Poor Ventilation and Ice Dams Create? Besides ice dams preventing snow from sliding off the roof, ice dams allow water to back up from the roof edge, under the shingles and allow water infiltration into your home's interior. This ruins insulation, damages drywall and paint. The weight of the ice dam hanging from your gutters may create sagging gutters and poor drainage. 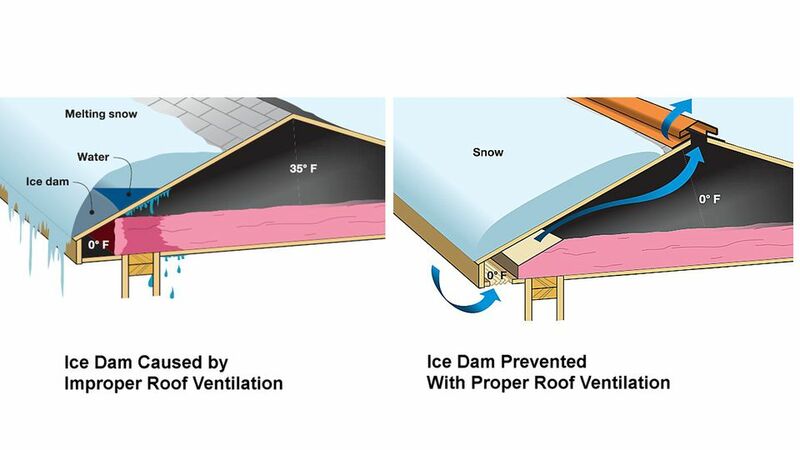 All around, ice dams are a problem but are very preventable with proper ventilation. The under-side of the roof in the attic space needs to be close to the temperature of the roof’s exterior side. Ventilation should be provided using adequate roof ventilators or a continuous soffit-and-ridge vent system. At the lower side of the roof you need to provide baffles for ventilation in the eaves. If the roof has attic insulation on the interior of the roof, provide at least a 2-inch air space between the roof insulation and the roof sheathing. By providing adequate ventilation the temperature of the attic will be lowered and as a result, so will underside roof deck temperature.